It is amazing how one member can change a band. Ever since Max Cavalera left metal stalwarts Sepultura, the group has steadily, sadly gone downhill. 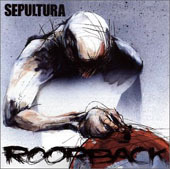 On their newest release, Roorback, most the elements that made Sepultura such an influential, powerful band were sorely lacking. The trademark tribal drums have virtually disappeared, the powerful lyrics and vocals are shadows of their former selves (of course, it is with a different singer than Max) and the guitars just seem to chug along. The group has gone from primal, raw heavy metal to almost a metalcore sound that is just not warranted (see “Corrupted” and “Leetch”). Perhaps they were going for an old school, Biohazard-like feel but they should not have to revert back to a late ’80s genre that was not their own – they are Sepultura. The mixing and production value could be partially responsible for the retro sound. Igor Cavalera’s drums, the few times that they have interesting fills, are mixed so low beneath the guitar that they are almost lost. While Derrick Green’s vocals are coarse to begin with, they aren’t particularly crisp. In few places is that more apparent then on the bonus cover of U2’s “Bullet The Blue Sky” on this release. It is, first off, a track that has been covered several times and, in this case, been covered much better. Band’s like P.O.D. have pulled it off much more powerfully, as well as cleaner and interesting. Just before the bonus cut is the album’s ‘end’, a track named “Outro”. It is basically a few minutes of silence followed by the guys messing around in the studio singing about the problems they had during the recording. Sadly the biggest issue was not broken microphones or losing tunes, it was the lack of focus, interest and Max.